Confocal immunofluorescent analysis of mouse embryonic stem cells growing on mouse embryonic fibroblast (MEF) feeder cells using SSEA1 (MC480) Mouse mAb #4744 detected with anti-Mouse IgG (H+L), F(ab')2 Fragment (Alexa Fluor® 488 Conjugate) (green). Actin filaments have been labeled with DY-554 phalloidin (red). Blue pseudocolor = DRAQ5® #4084 (fluorescent DNA dye). Flow cytometric analysis of untreated Jurkat cells using Akt (5G3) Mouse mAb #2966 detected with Anti-Mouse IgG (H+L), F(ab')2 Fragment (Alexa Fluor® 488 Conjugate) (green) compared to a nonspecific negative control antibody (red). High content analysis of A439 cells exposed to varying concentrations of caffeine for 30 min prior to and 1.5 hr following a 100 mJ UV-treatment. 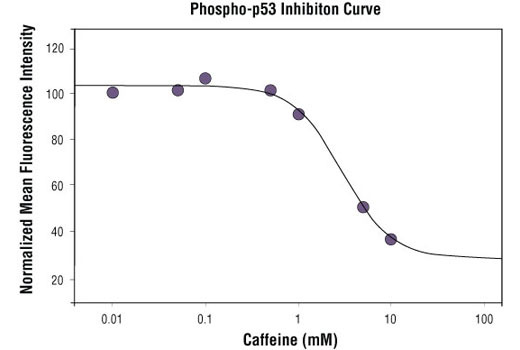 With increasing concentrations of caffeine, a significant decrease (~2.5 fold) in phospho-p53 signal as compared to the UV-treated control was observed. When using phospho-p53 as a measurement, the IC50 of this compound was 2.95 mM. Data was generated on the Acumen® HCS platform using Anti-Mouse IgG (H+L), F(ab')2 Fragment (Alexa Fluor® 488 Conjugate). The optimal dilution of the anti-species antibody should be determined for each primary antibody by titration. However, a final dilution of 1:500 – 1:2000 should yield acceptable results for immunofluorescent and flow cytometry assays. 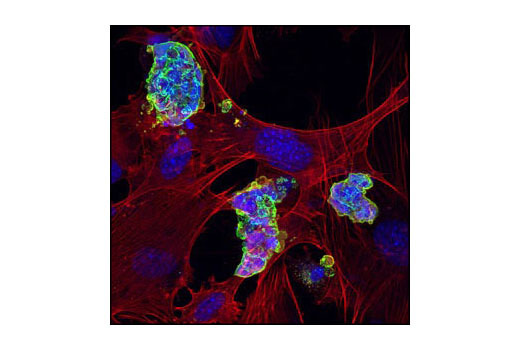 Anti-Mouse IgG (H+L) F(ab')2 Fragment antibody was conjugated to Alexa Fluor® 488 fluorescent dye under optimal conditions and formulated at 2 mg/ml. This F(ab')2 fragment product results in less non-specific binding, as it lacks the Fc domain that can bind to the cells with Fc receptors. F(ab')2 fragments are prepared from goat antibodies that have been adsorbed against human IgG and human serum.